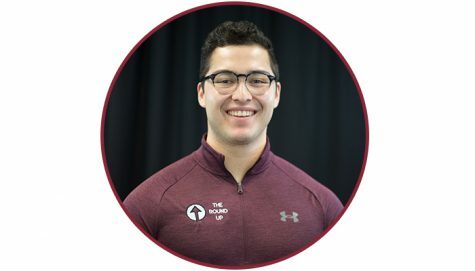 Derek E. Gonzales enters his third year as an employee of the New Mexico State University Round Up and first as the Editor-in-Chief. The homegrown product played prep basketball at Oñate High School and has held a variety of positions in athletics. As a freshman, Gonzales worked inside the NMSU Athletic Department as a Marketing Intern. His duties included setting up advertisements, tabling events, cold calls to potential ticket buyers, and even included doing part-time public address announcing for volleyball (including 2016 WAC Volleyball Tournament) and men’s basketball. As a writer, Gonzales has become a prominent collegiate sports reporter in the state of New Mexico. Gonzales covered the 2016 NCAA Tournament in Tulsa, Okla. as No. 14 NMSU took on No. 3 Baylor. A year later, Gonzales returned to the Big Dance, covering the No. 12 Aggies against the Clemson Tigers in San Diego. A men's basketball article written by Gonzales was tweeted out by CBS Sports' Dennis Dobbs during the Aggies conference championship run. The Las Cruces native wrote a highly-controversial opinion piece on former Aggie head coach Paul Weir, who left NMSU for in-state rival New Mexico, upsetting much of the fan-base. The article gained attention statewide and Gonzales subjected himself to criticism because of its honesty, cementing himself as a credible sportswriter in New Mexico. Covering college football, Gonzales became the first sportswriter since 1960 to cover New Mexico State in both an NCAA Tournament and bowl game within the same calendar year, as he was on hand to witness the Aggies end their 57-year bowl drought in the 2017 NOVA Home Loans Arizona Bowl against Utah State. Gonzales has also been published in The Louisiana Advocate for his game recap of the 2016 Louisiana-NMSU football game. On top of working at The Round Up, Gonzales also works as the Sports Freelancer for the Las Cruces Sun-News. In two full academic years at the Sun-News, Gonzales has written over 75 articles, covering NMSU athletics and Las Cruces preps. Gonzales aspires to be a sports writer or a sports information director upon graduation in May 2019.